Overtaken by nature and too hot to handle for institutions, the 1935 open-air theatre has been reclaimed by the city’s residents as an informal place of leisure. “In my snooping around town for ghosts, I had discovered the solidest ghost of all – a Nazi amphitheater nestled in the hills above Heidelberg. Going there became an obsession with me. Nobody in Heidelberg seemed to recognize the existence of the place and this denial gave the amphitheatre an added appeal” wrote Erica Jong in her 1973 book Fear of flying. The narrator, while living in Heidelberg, discovers the amphitheatre and decides to write about it. Nowadays, you can reach the amphitheatre by driving across the river from the old town, down a street which leads to the suburbs and then up the Heiligenberg (the Holy Mountain) or you could just walk through the forest. The open-air theatre was built in 1935 and is called Thingstätte. The “Thing”, derived from the word “Ding”, referred to the place where Germans, understood as the ancestors of the National Socialist regime, gathered for trials and large assemblies. The word Thingstättemeans “place of gathering” with a reference to the Germans and the idea of gathering people who belong to the same group. Today, a partly ruined amphitheatre made of local red sandstone and surrounded by forest, it is barely mentioned in touristic brochures and Heidelberg city guides. Instead, great emphasis is laid upon the romantic heritage of the city, with the idea that Heidelberg is one of the few German cities that was not destroyed by aerial bombing during the Second World War. Compared to the crowded old town, the Thingstättegives the impression of a peaceful place that very few tourists know or dare to explore. Taken over by nature, the place is actually known by many students who throw parties there at night and by inhabitants who enjoy jogging or sharing a picnic with their family on the amphitheatre’s steps. This place is the most intriguing architectural Nazi heritage in the city among the other buildings from this period in Heidelberg, which are barracks and a hospital. 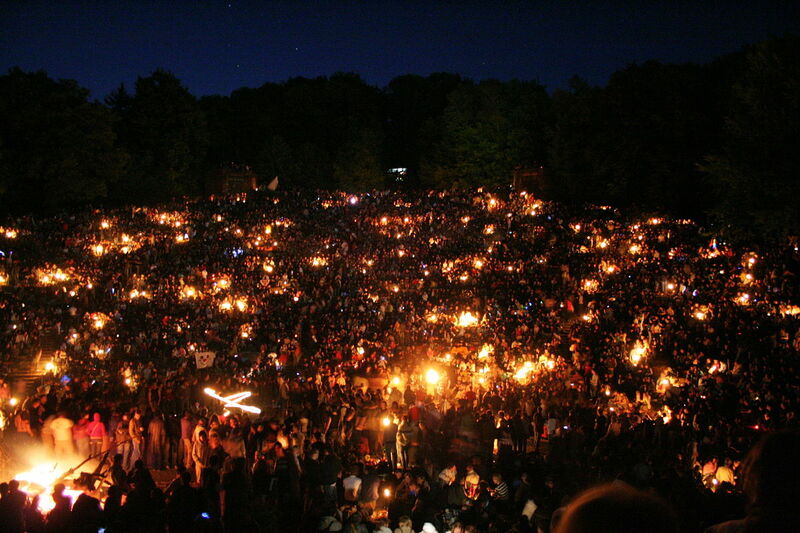 Walpurgis Night at Heidelberg’s Thingstätte. The National Socialist regime planned on building around four hundred amphitheatres in Germany. Those amphitheatres were called Thingstätte and the plays Thingspiele. The architectural purpose was to build these open-air theatres in cities and places that were meaningful to the National Socialist discourse. Heidelberg was chosen for three reasons. First for its romantic past, which matched the Nazi discourse of idealizing the German Nation. The myth of Heidelberg as the city of sanctioned German culture emerged in the 19th century,: the ruined castle was the subject of various writers’ works, as well as becoming a tourist attraction. The fact that Goethe and Victor Hugo in 1839 and 1842 went to Heidelberg also serves to nurture the idealisation of this city. The castle then became the symbol of Heidelberg. Secondly, the city developed this touristic image during the 1920s in connection with theatre. Indeed, a theatre festival was organized each year in the castle’s garden and Heidelberg quickly became a city renowned for theatre. Joseph Goebbels, for example, had been a student of the university in the 1920s and completed his PhD on the German romantic author Wilhelm von Schütz in 1922. As a former student of the university Joseph Goebbels was decorated honourable citizen of Heidelberg in 1939 and played a great role in the opening of the amphitheatre in Heidelberg. The National Socialist regime and the mayor of Heidelberg, Carl Neinhaus – who was the mayor of Heidelberg between 1929 and 1945 and between 1952 and 1958 – promoted the city’s romantic past and theatrical tradition because it was thought that the amphitheatre would appeal a great number of people, not only Germans but also foreign tourists. Finally, the third aspect would be the German memory embodied in Heidelberg. The amphitheatre was said to be located where the Germans gathered themselves: some archaeological research was done very hastily in order to testify to the “sacred” value of the area even if no evidence of the presence of Germanic people was to be found. The memory, as well as the history of the city, was thereby manipulated, and the legitimation of the construction was to be found at the heart of this very same manipulation since the archaeological research wasn’t actually scientific. 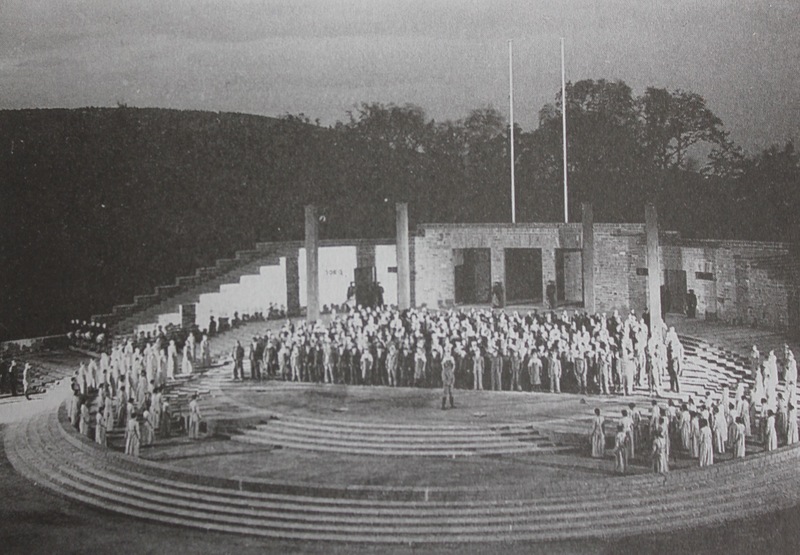 Staging of Kurt Heynicke’s “Der Weg ins Reich”, on June 22, 1935. The so-called Thingsbewegung movement was meant to be at the high peak of modernity: it had first developed at the beginning of the 1920s as German language theatre was questioned by theoreticians in Germany and in Switzerland. For the regime, the Thingsbewegung was part of a national cultural revolution that the regime wanted to impulse against the avant-garde of Weimar. Therefore the minister of propaganda, Joseph Goebbels, founded the “Reichsbund der Deutschen Freilicht- und Volksschauspiele e. V.” in 1933, an association of authors and architects who were to imagine a new kind of theatre: to write mass spectacles. This open-air theatre served as a formal reminder of antique Greece, a civilization that the Nazis looked up to. It was conceived for the People (for 50.000 spectators at Annaberg in Silesia for example), which is why the plays had to be understood by everyone: they often followed the same simple canvas, telling the story of lost and poor people rescued by a Führer, a guide that will eventually lead them. In such plays, text alternated with song. The movement was supposed to link both the tradition of classicism (choir, amphitheatre, canvas that reminded Greek tragedy) and modernity (elaborate lighting and sound system, the community of spectators and actors). In 1935 twelve amphitheatres were opened with welcoming propaganda plays, which were also staged in Berlin during the Olympic Games of 1936. If Berlin was to become Germania, the new capital of the Third Reich, Heidelberg and its amphitheatre were to embody Germanic culture in its entirety – as promoted by the Nazi regime. Another amphitheatre was opened on the Loreley rock at the Rhine in 1939: the location recalled the poem written by Clemens Brentano in 1801, on the Lore Lay, an enchanting female. The Heidelberg amphitheatre, built after a design by the architect Hermann Alker, was built in a record time with the support of the Reich Labour Service, between May 1934 and June 1935 and could accommodate 15 000 people. The construction had to reflect the project of the National Socialist regime, and thus be stunning. Joseph Goebbels emphasized the importance of the Heidelberger Thingstätte in his opening speech on the 22nd of June 1935, declaring Heidelberg as the example for all the others in Germany and the most beautiful. However, the project started to go downhill very quickly: the plays (Thingspiele) written especially for their locations did not live up to expectations: critics found that they lacked dramatic action, the public itself found them redundant and the writers could not manage to regularly write new plays for the twelve amphitheatres built in Germany. Moreover, the maintenance costs of such cultural infrastructure was very high. From the opening, on June 22nd 1935, to 1939, solstices were celebrated and three plays were staged, one of them being The Bride of Messina by Friedrich Schiller (1803) –which uses elements from Greek tragedies. This piece reminded the very sacred past of Heidelberg as one the bastions of Romanticism and underlined that the Thingspiele were considered poor cousins to the more classical plays. Also, the project was quickly criticized from an ideological point of view within the Nazi Party: Germans were celebrated and so was the Führer, yet, Christian connotations and socialist elements were too strong, and the racial ideology and the idea of Blut und Boden (Blood and Soil) weren’t present enough for Joseph Goebbels. Taking such a position on this folkish matter was also a way for Joseph Goebbels to supplant his rival Alfred Rosenberg, another ideologist of the regime. Decisions to suppress the choir, regarded as a socialist element, and to rename the Thing-movement with a decree on the word “thing” in October 1935, illustrate indeed the very short success of it: Joseph Goebbels declared that the German word “thing” was backward and therefore that it could not apply to the Reich that had to be vivid, living and modern. After 1945, the Thingstätte in Heidelberg stayed like it was. Flags were removed but as Heidelberg was not bombed, the amphitheatre wasn’t destroyed. Americans soldiers moved into Heidelberg and organized basketball matches, boy-scouts’ meetings as well as some masses for Easter at the amphitheatre. These Protestant religious and American mundane rituals were presented as important for American – German reconciliation; a form of catharsis against the idea of German superiority and purity, embodied in the architecture and the dramas it staged. 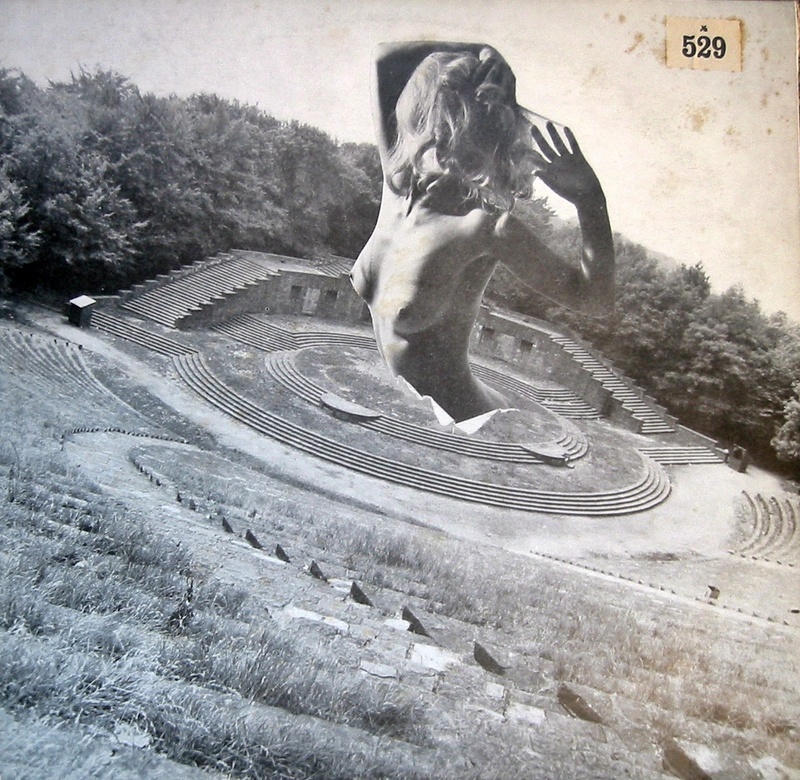 The cover of an LP with recordings from the International Holy Hill Jazz Meeting, which took place at Heidelberg’s Thingstätte in 1969. Since 1989, the Thingstätte has been registered as protected heritage as it allows an insight into some aspects of the National Socialist regime. But ever since its ranking as a monument, fewer events have been organized up the hill, and it seems that the desire to protect the building may be actually more of a burden. Some jazz and classical music concerts have taken place there but the amphitheatre is difficult to reach and there are no facilities for the public. These explanations, given by the city and the company responsible for its marketing, might be a way to avoid the debate around the problematic place. Various propositions have been made by the city council to transform the place into a leisure area but the city finally abandoned the projects. From a practical point of view, the city appears to face many difficulties in maintaining and managing the Thingstätte. But the amphitheatre also appears to be a “cumbersome patrimony”, from the concept developed by the German historian, Norbert Huse in 1997. Huse wrote about the hereditary load from the Third Reich (“Erblasten des Dritten Reiches”) that brings to mind historical events that should not have happened. In the eighties, the city council of Heidelberg debated the reinstatement of the amphitheatre and renaming: events staged in the theatre could be seen as a retroactive legitimation of the cultural activities of the Third Reich, or as being compromised by the history of the place. But such events could also liberate the place from its former history. The general consensus in other cities was to rename it because the original name (“Thingstätte”) was too charged with problematic meaning: in Berlin, it is today the “Waldbühne” (the forest stage) and the “Freilichtbühne” (the open air stage) on the Loreley rock. The debate in Heidelberg fizzled out before it reached a conclusion. There are currently so many rules that are to be followed for each event in the Thingstätte in Heidelberg that almost no one has proposed an event and there is no more debate today about the reinstatement of the amphitheatre and its consequences. In Berlin and at the Loreley, choices were made: today they both function as important venues for music and shows, and having been slightly adapted for modern public use. Explanatory panel at the Thingstätte. 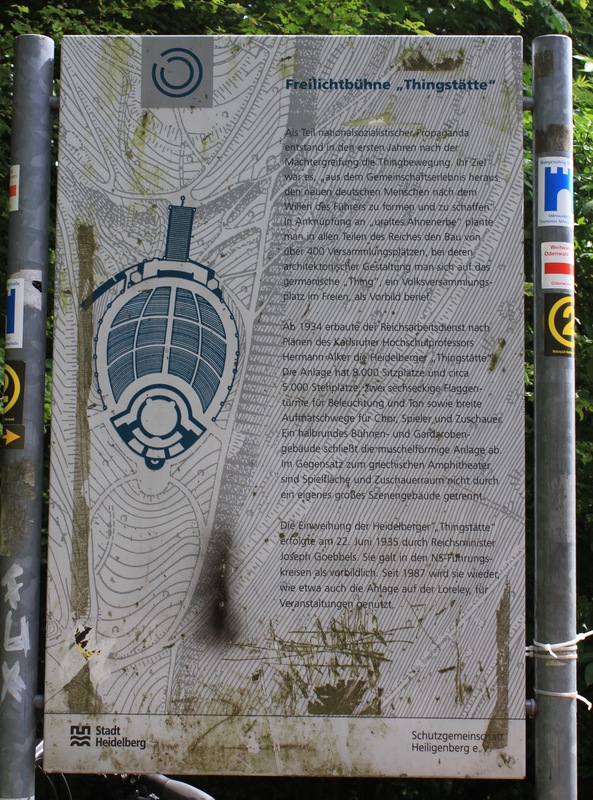 In Heidelberg, some explanatory panels have been installed in 1992, three years after the monumental listing of the Thingstätte, but they are not clearly visible to the public. Few visitors come to the site, some inhabitants go to the amphitheatre for a jog or a picnic. It seems that the ‘ruin value’ theory of Albert Speer, Adolf Hitler’s architect who lived in Heidelberg between his release from prison and his death in 1981, still holds up here. His wish was to ensure that his creations would convey the spirit of the Third Reich to future generations. While the material and the project seemed particularly modern in the 1930s, they were clearly classical in influence, modelled after Greek and Roman buildings. Yet the actual state of ruin of the amphitheatre underlines the impact of time – a sinking foundation was not orchestrated, making the place difficult to maintain today. Nowadays, memory is not much emphasised: recreational use has been chosen by inhabitants as a contemporary investment in this place. While the Heidelberg city council and marketing board seem to have lost their interest in this place because they would rather pay attention to the more obvious and accessible tourist destinations, its inhabitants have chosen to live with it as a place of leisure, whether or not sensing its historical load. The hesitation of local authorities to deal with the amphitheatre and the resulting lack of institutionalisation leaves the place open for Heidelberg’s inhabitants to appropriate it according to their wishes. The people, not the state, lead the management of memory. Still a silent witness to an uncomfortable past, the amphitheatre has traded most of its political significance for the mundane, everyday recreation. Currently a PhD candidate in German Studies and in History of Art in Paris 3 Sorbonne-Nouvelle, Cécile Poulot holds an MA degree in Art History from Heidelberg University. Her research interests focus on architectural and urban history of the interwar period mainly in Europe.